Why didn’t they pack beds? It looks like there wouldn’t be a problem storing them on Rollo. 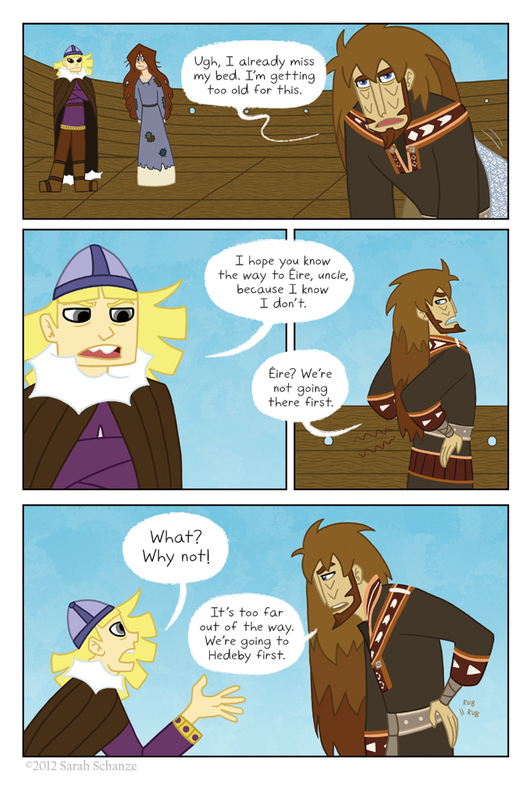 Except for chiefs/nobles/whatever, I don’t think beds were really brought on ships. They were rare even in houses. And if there was a bed on Rollo, Coal’s mother was in it, and that’s still in the mound. In other words I just wanted to make Loki suffer. THE MARK OF A TRUE AUTHOR: MAKING CHARACTERS SUFFER AND ENJOYING IT. A rest-stop with snack machines and clean restrooms? Now, did Loki not tell him that up front because Coal wouldn’t have agreed, or just because he needs to keep up his Trickster stuff? Best smell in the world! Bwahahahahhahahahaha. Is it just me, or in that last panel, does Loki’s hair hang like a girl’s? It’s hanging exactly like one of my best friend’s hair does when she first wakes up. Ah, how funny. It’s not so much what as who. Mwa ha ha. Man makes plans, Loki laughs. Loki is the best at plan-breaking. Oh no Coal, you’re gonna be stuck on a ship w/ a girl. Looks like you gotta keep your complainy face out longer. His complainy face would be out whether she was there or not. Loki dumping her before she sacrifices us to her gods sorta takes presidence over hedeby. Hahaha, yeah but it’s so far awaaaaaay. I just love Loki making Coal’s live impossible.